by jamiesaunders ~ November 23rd, 2010. Filed under: Uncategorized. 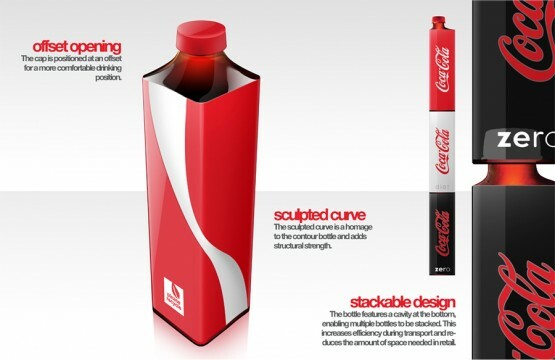 I was initially drawn in by the bottles’ bold and interesting design, and secondly, I was curious why these pictures were in a blog about sustainability. It turns out the rectangular design enables far more bottles to fit into a shipping pallet and on store shelves. 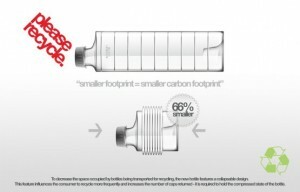 In addition, the bottles are built to stack on top of one another to further eliminate wasted space while in transport. The bottles are also ribbed to compress, as shown in the picture above, and take up less space throughout the recycling process. Akina mentioned that this concept is still an idea. If that is the case then I don’t no what Coca-Cola is waiting for. I love this idea and design. 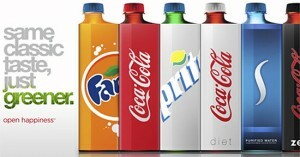 I would be compelled to try one of these new bottles even if they were no more sustainable than the current ones. Even if Coca-Cola has to rely on this trend, as the bottles’ mention of sustainability is very subtle, I remain confident that it would have great success. 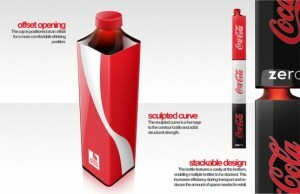 The new packaging saves Coca-Cola shipping costs and saves store owners shelf space. Finally, its eye-catching and appears functional and attractive. Oh ya.. and its good for the environment.